I'm on a roll like a coconut down a moderately steep but short grassy hill. What!? I don't get on much of a roll too often. But like I said previously, I am back on my coconut using and consuming kick again, this time I am adding coconut milk to the mix. I have been making my own shampoo and conditioner, but since I had all this coconut milk I wanted to try some thing else. I also messed up my last batch, possibly put too much oil, or added it twice in the 'poo'. I don't know. So this is a perfect time to try. My hair is in a grow out stage, I am taking biotin, pre-natal, and just about anything else I can find. My hair is growing fast, and oh how the natural red is coming out. I have the most naturally mashed up hair color. It looks like dark dirty dishwater ash blonde, but that's a cool color right... but with red?! Yeah, awesome, then as it grows out its super blonde at the ends. I have that 'natural-Carrie-"Ombre"-hair'. But heavy, and stick straight with some odd waves in my under layers where it's the thickest. Did I mention I haven't had it trimmed, and I have some crazy layers from past 'damage control chopping sessions'. With all that said commercial hair products were not fixing any type of damage, wasn't smoothing any hair. I couldn't naturally dry because my layers would just get all wonky. I have found that natural homemade shampoos and conditioners really lay my hair flat, and seals the hair shaft to produce the shine. I have been using Bragg's ACV (apple cider vinegar) for conditioner. I don't bother mixing it either I just dump it in, let it sit while I shower and rinse under cooler water (generally as I start to loose my hot water I start to rinse). Works! No it really friggin' works. I read many peoples reactions to this concoction (notes further down about that), and I will add mine: Not too shabby! You do not need a conditioner after. I am going to try with oil oil, and maybe coconut oil. My thicker hair does feel very heavy and I am not sure if it's the olive oil. The original recipe called for vitamin E, almond, or olive oil. I passed on E because I was thinking it would be even more heavy to mix, and rinse. 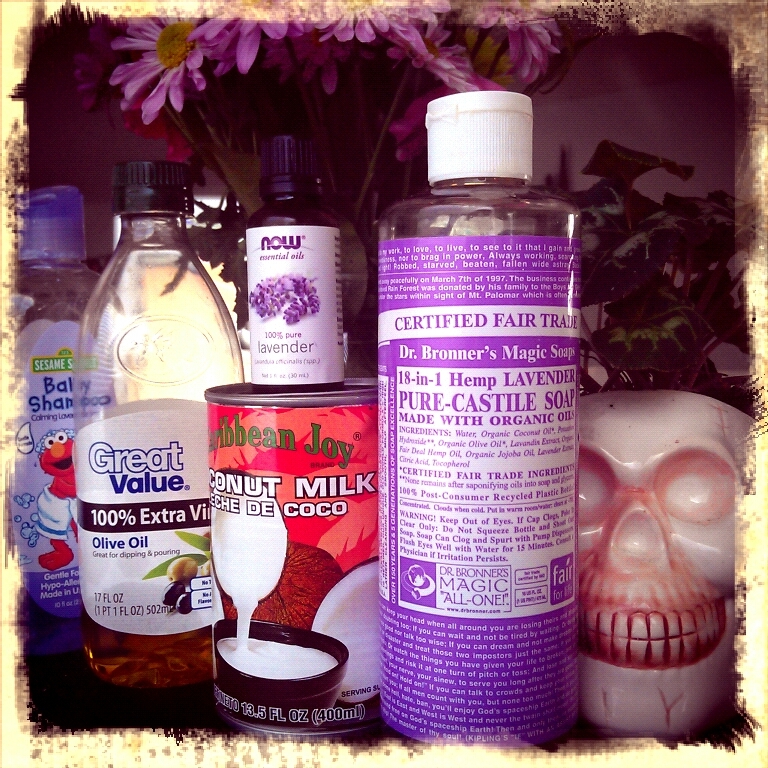 My top layers are not as smooth as I like as if I used my ACV, so next time I will coco-poo, and ACV rinse! Oh no! I ran out of liquid soap! 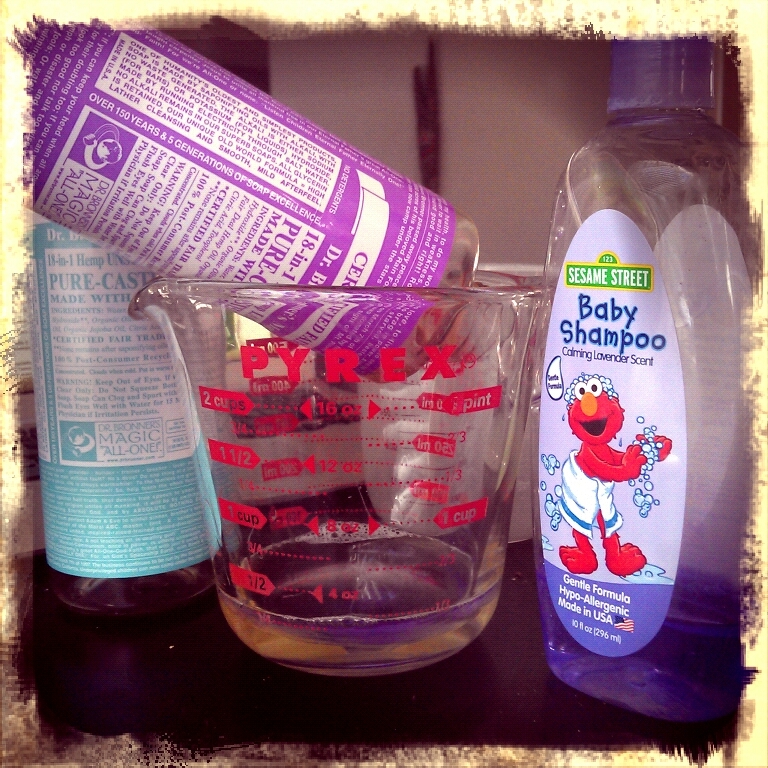 I swiped my kids lavender baby shampoo, score! Not what I really wanted to use but its gentle. Squirt bottles like a condiment bottle works great. I just reused my empty liquid castile bottle. Shake to blend, and shake before use. Natural ingredients will settle. Remember liquid castile soap does not foam as much as commercial soaps. No chemicals! So I like to section my hair and work each area from scalp to tip adding more if needed. Don't double the recipe unless you wash everyday (not recommended no matter what you use) because some ingredients require refrigeration. Even after using a ACV(Apple Cider Vinegar) conditioner you won't feel super smooth right away like commercial conditioners (those are the chemicals at work). ACV balances your hair, seals your shaft back to what I call; it's natural normal state. Use a wide tooth comb and fingers, and air dry, or cool dryer. As your hair dries you will start to feel how soft your hair is. Give it time, and make time. The first time devote time to see what your hair does after a natural dry! And your hair needs time to adjust too. You don't always have to add EO (essential oils). Liquid castile soap smells awesome if you get a scented. EO is not just for scent, they also have serious function! So unless you know what you need your concoction to do best use scented liquid castile soap or lavender EO. The thing is about Hemp milk it doesn't have the properties of coconut milk. THis formula is really based around coconuts and its ahhh-mazing properties. Just a heads up, I get my coconut milk from the Dollar Store!!!! !